This plant was imported into Australia around 2003. It is obviously from guaranitica origins but has been bred to be about half its height i.e about a metre. 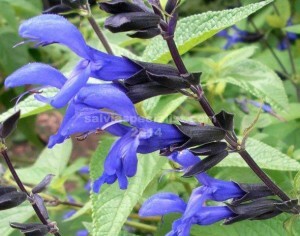 Like guaranitica it has tubers and spreads enthusiastically when there is moisture. It continues flowering right through summer when some of its relations show their displeasure at extreme heat by stopping flowering for a while. It will grow in a little shade as well as full sun. It is winter dormant. If you are not worried about it spreading or can put it where it is limited it is a real joy with its gorgeous colour. Mine stays fairly low, about half a metre, but I have seen it much taller. It can be propagated by cuttings or division. Its closest relation is probably the regular guaranitica which has been around in Australia for a long time and caused many gardeners anguish with its spreading habit.